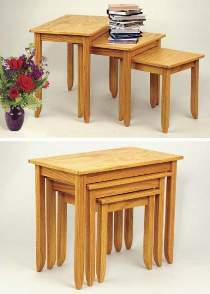 Three tables that can be stacked one inside the other. When company comes, set them out to hold food and beverages. This plan includes scale drawings for all three tables. Build them from 3/4" oak or other wood. The largest table measures approximately 24"H x 28-1/2"W x 16-1/2"D.